Very Good. 0307408876 ALL BOOKS SHIPPED WITHIN 1 DAY OF PURCHASE! If you read only one book on this subject, this should be the one. 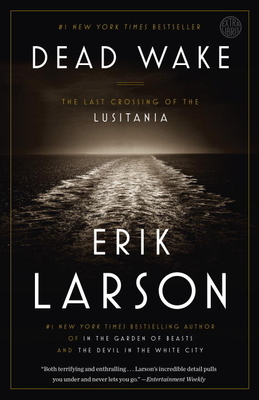 Mr. Larson weaves a compelling and unique story around the events surrounding the sinking of the Lusitania from all perspectives. Well documented and crafted. Enough detail to inform, enough skillful narrative to be engrossing and hard to put down. Rewarding and a pleasure to read. A powerful chronicle not likely to be surpassed! Erik Larson has tried to bring in as much background information as possible, so the sinking of the Lusitania (a British ship loaded with American passengers) can be understood in context instead of being seen as an isolated, outrageous, and unprovoked act of war. For example, it had never occurred to me that the British were so good at tracking the locations of the U-boats, or that so many other ships were being sunk right around this time (including some American ships). Beyond that, the British had no strong motivation to protect American lives because they correctly foresaw that an incident like the Lusitania sinking would bring America into the war on their side. This book is easy to read, clear, and very enjoyable. Everything you have ever wanted to know about the Lusitania-- and then some. Very well written, but slow at times because of all of the detailed information about the ship and the U-boat that sank her. Would be enthralling to a naval engineer, but foreign to the common person. Also explores the political, social and economic climate of the time to explain some of the unusual circumstances. No great suspense novel, but very interesting and informative. Yet another spellbinding book by Erik Larson. His research and writing style are without parallel. A great book!